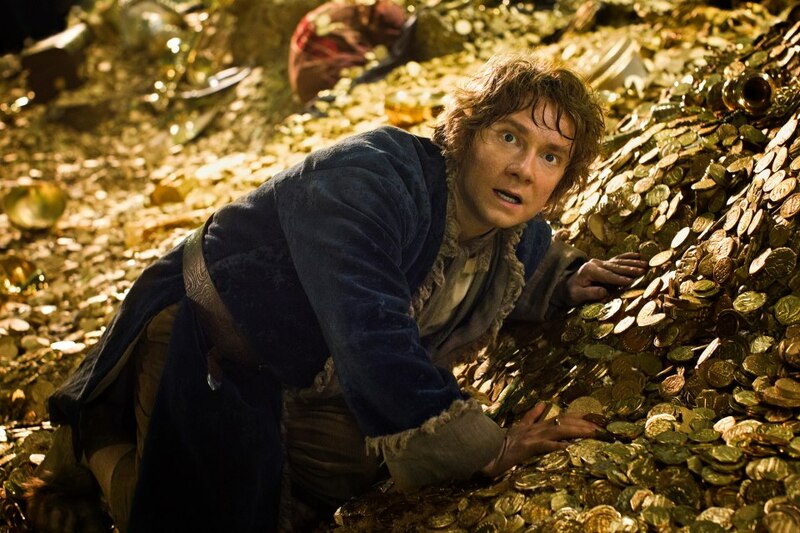 The Hobbit: The Desolation of Smaug has about thirty minutes of plot in a three-hour movie. Director Peter Jackson wanders on scenes in his new picture about Middle Earth, hoping the film eventually moves somewhere, but he finds no success. Jackson’s Lord of the Rings trilogy was never something I really enjoyed; the pictures for myself are overlong and lack emotional tension or a tight narrative throughout their lengthy runtimes. I admire the technical enhancements, but they pale vastly in comparison to an epic like Apocalypse Now or Metropolis, which add intimacy to even their largest scenes. The Hobbit: An Unexpected Journey extends the flaws of The Lord of the Rings to a greater extent; hardly anything happened but a string of mindless fight scenes and cringe worthy comic relief supplied by singing dwarves. The Desolation of Smaug is an improvement over its predecessor, but there’s still no rhythmic flow or purpose to the movie, more of an excuse for Warner Brothers to wring more money out of a profitable franchise. Continuing on his trek to the Lonely Mountains, Bilbo Baggins (Martin Freeman) travels with thirteen dwarves, led by Thorin Oakenshield (Richard Armitage) as well as Gandalf (Ian McKellen) to retake the dwarfish kingdom controlled by Smaug (Benedict Cumberbatch), a devious and deadly dragon. The gang meets Legolas (Orlando Bloom) and his team of wood elves, then they head to Lake-Town before departing to Smaug’s ruins. The story is layered with a countless number of subplots, either there to constantly remind audiences that this is a prequel to the Lord of the Rings or to act as filler. While the focus on Tauriel (Evangeline Lilly), an elf who takes a liking in one of the dwarves, works, other narrative shifts don’t and the film switches from different character perspective in hopes of finding a compelling story to latch on. However, by doing so, Jackson never manages to explore the real personas of the protagonists, a major aspect that hurt the Lord of the Rings trilogy. Almost all the dwarves have interchangeable personalities with the only way to tell them apart is by physical appearance and most of the other characters could one-word descriptions attached to them. The trip to Lake-Town offers a chance to shed some light on the poor settler’s ravished by Smaug’s fury but that receives little attention. The story isn’t helped by the visual effects, which make the film look like it has the imagery of a video game. Nothing looks or seems real and further distances the audience from J. R. R. Tolkien’s recreations. There are upsides to the film. Martin Freeman provides a charismatic and charming performance as Bilbo, idealizing the cheerful and innocent personality of the character. Benedict Cumberbatch gives Smaug a lively and energetic voice, making the dragon a menacing and effective villain. But Bilbo disappears for half of The Hobbit and Smaug’s only in the last forty minutes, which ends with a cliffhanger that feels makes it feel that the producers cut off extended footage that had more resolution. The Hobbit: The Desolation of Smaug will please enthusiasts of Jackson’s previous trilogy, but for anyone not part of the fan-base such as myself, it’s a dull and largely self-indulgent picture, a big and noisy disaster. Great review. You said it all in the last sentence. Thanks! It was boring for me and not worthwhile watching. I was a fan of the LOTR, Jackson’s previous trilogy, but this was largely a disappointment. You said it perfectly in your first senence: thirty minutes of plot in a three-hour movie. Glad you agree. It was really obvious that Jackson stretched out some scenes and there wasn’t enough plot to carry out the entire film. Interesting. There seems to be two systems of thought on this movie. Many really like it even more than the first. Other find it dull and plodding. I’ve promised my son that my first viewing will be with him therefore I haven’t seen it. Soon though. Thanks for the comment. Most people I’ve talked to really like it and I’m one of the few people who just isn’t into the Lord of the Rings. I hope you enjoy it. Different from many of the reviews I’ve been reading in the blogosphere, but closer to what I’m expecting. Hopefully I enjoy it more than you when I finally make it out to this one. Thanks! I found the movie to be too tedious for my liking but most people seem to enjoy it, plus I’m one of the few people who isn’t into the Lord of the Rings. I’m not either. Well of the books anyway. I don’t think Tolkien a very good writer. And I’m not a terribly big fan of turning a frivolous kid’s book into an ominous trilogy serving as prelude to another dark trilogy for what appears to be a significant cash grab. But I’ll try to set those thoughts aside when I sit down to watch this sequel. We’ll see if I’m successful. Thanks! Smaug was excellent and the best part of the film. I must say, I quite liked the new film but it was plagued by long stretches where virtually nothing happened. Plus, I found it annoying how the film included scenes as a prelude to the LOTR trilogy in an effort to build tension. Kind of failed because LOTR came out 10 years ago and everyone knows how it ends because everyone saw it at the cinema so the scenes don’t build tension at all and just act as gimmicky Easter eggs….at least, that’s what I thought about it. I agree, the hints and references of LOTR bogged the movie down. Jackson seemed to constantly remind audiences that this is a prequel to the trilogy. It was a fine piece of entertainment/fluff, however, I expect a lot more from Jackson with this upcoming, and hopefully final, installment. Good review. Thanks! I feel Jackson overextended the movie past its limit. It could have been cut down a lot to make it a better film. Nice review. I actually enjoyed this one quite a bit more than I expected to, though I can definitely understand your concerns here. It does feel very much like they’re just stretching the plot thin so as to cash in on having more movies, when a good portion of both this and its predecessor could have EASILY been condensed into a single film. Thanks! I feel the same way about the story; 5/6s of the plot seemed like it could be told rather quickly. Definitely seem to be two camps with this one. I’m checking it out this week and really looking forward to it. Nice review pal. Thanks! If you’re a LOTR fan, you’ll probably like it. I found the movie to be pretty boring. Thanks for the comment. I never quite got fantasy as much as others, but you’re right that it’s a film primarily for fans. Enjoyed reading – have been largely avoiding other people’s reviews of this until I’d seen it myself. I liked it more than you but I can see why certain things you mention would bring it down for a lot of people. I’d never thought that I’d enjoy films of Tolkien’s books, but (to different degrees) I’ve enjoyed all five of Jackson’s to date. Thanks! I’m one of the few who didn’t like the Lord of the Rings, the movies just don’t appeal to me. I liked Freeman’s performance but the film was too long.